Here's another great resource for energy communicators: BP Energy Outlook 2030. It has a wealth of data about energy production and use worldwide in 2010 and dares to describe the fast-approaching energy world of 2030. And it presents all this through highly creative graphics like the one above, which consolidates the 2030 expectations for global economic growth, population, energy use, energy use per capita and energy use per GDP into a single graph. 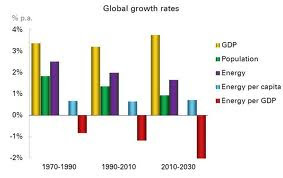 In brief, the Outlook presents a world that is slowing its population growth (but still adding 1.4 billion in the next 20 years), speeding up economic growth (largely outside the OECD), and rapidly improving its energy efficiency, which leads to significant decreases in the amount of energy required per unit of GDP. Overall, energy use will be up about 40%, with nearly all of that increase coming from developing economies. Nothing can change fast in energy trends. As BP sees it, the make-up of our future energy use will be similar to today's - about the same proportions coming from coal and nuclear as now; quite a bit more from renewables, on a percentage basis, but still up to only 11% of the world's electric power generation. The biggest changes are in oil, which will grow only slightly - partly because of rising prices - and will drop significantly in terms of its share of energy supply; and in natural gas, which is rapidly becoming the "go-to" fuel worldwide. It is expected to provide over a quarter of the global energy supply. The world's total dependence on fossil fuels will drop from 88% of all the energy we use today to about 81% in 2030. The United States should be in much better shape than we have been in decades - requiring less imported oil and increasing our exports of natural gas. On balance, because of the oil and gas fields being developed on- and off-shore, we'll be getting closer to that elusive goal of energy independence. The report clearly shows that we need to make the most of all energy options as well as opportunities for improvements in energy efficiency. It's often a hard case to make to influentials and the public. Check out this report - it can help.